I’ve been writing a lot on the blog recently (I’m on sabbatical from City Tech to write several articles), and I usually post updates on twitter, and I also have an RSS feed available for those (like me) who use Feedly. But if you would like to get an email when I make a new post, I’ve now set up a list which you can sign up for here. Mailchimp will send you an email once a day at 4am only when I post something new here . Thanks for reading! controlgeek.net Meetup/Geekout at Infocomm 2011 Orlando! 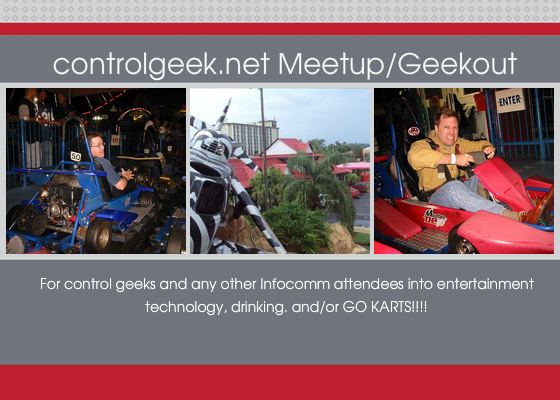 With help from Jim Janninck of Timberspring in Orlando, I've set up the first ever controlgeek.net Meetup/Geekout for control geeks and anyone else in Orlando for Infocomm who is interested in entertainment technology, drinking, and GO-KARTS!. We will be meeting at a bar/restaurant at 6pm on Wednesday, June 15, and then heading out for GO-KARTS! at 8pm. More drinking may take place later as well, but we'll play that by ear. Please RSVP here so I can get a rough head count, and also have the ability to email you if anything changes at the last minute (as often happens at these trade shows). For the Tribeca Film Festival "Drive In"
Tribeca Film Festival Drive In Starts Tonight! We had a rainy load in, but the weather for the shows, which start tonight, looks great! More info here.